The grout lines in my tile vanity are permanently stained. How do I get them clean? You’ve had your vanity for several years, and although it is in great shape structurally, its appearance isn’t too fabulous. 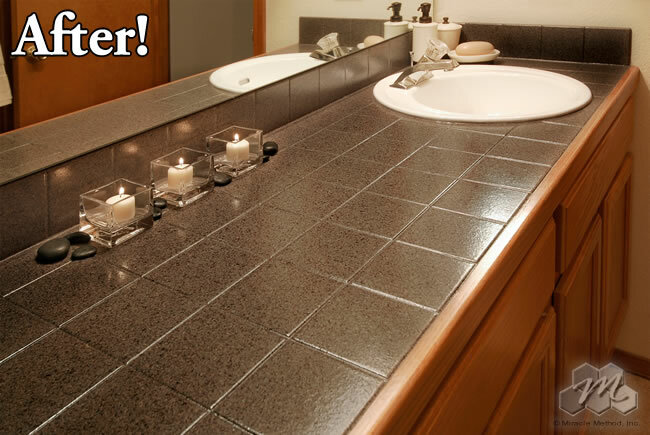 Over the years, dirt and dust, soap residue, hair spray residue, and the likes have found their way onto your vanity and into your grout lines, and no matter how hard you scrub with those cleaning products that promise to remove the most set-in stains, you can’t get them clean. You finally start to think about whether or not you should just replace the whole thing. Before you replace, there’s another option to consider that will save you time and money – bathroom vanity refinishing by Miracle Method. Our refinishing process is usually completed in one day and typically saves our customers up to 75% over the cost of removal and replacement. The process includes repairing damage and restoring your vanity to a like-new look and feel. We will permanently seal your grout lines, making them easy to keep clean, and can even change the color of your grout lines if you wish. In just a few days, you’ll have a sparkling new vanity that will transform the look of your entire bathroom. Before: Vanity grout lines are hard to keep clean. After: The vanity looks like new and best of all, the grout lines have been permanently sealed, making them easier to maintain. 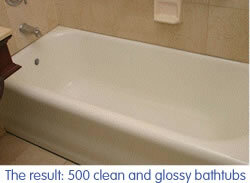 Visit the Miracle Method website for more information on our bathroom vanity refinishing services. If you are ready to get started, use our online locator or call 855-212-7337 to reach the Miracle Method franchise closest to you. We’re not called “Miracle Method” for no reason- our bathtub surface refinishing method makes an astounding difference on even the worst bathtub disasters. 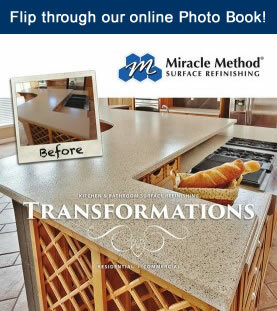 Take for instance on of our case studies, in which Miracle Method came to the rescue of the Milwaukee Hilton! The hotel was experiencing an awful “squishy bathtub” problem. About 500 units with worn out and discolored bathtubs had been “upgraded” with new bathtub liners. However, only 2 years later, most of the liners had failed, allowing water to collect between the tub and liner, and resulting in a “squishy” feel underfoot, as well as mold and odors resulting from the stagnant water. Replacing 500 bathtubs would have been incredibly expensive, time-consuming, and disruptive to hotel guests, so the hotel made a wise decision. They called Miracle Method to the rescue! 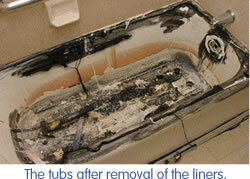 Miracle Method removed the liners and began work restoring the original bathtubs. Chips, cracks and scratches were mended, and the tubs were thoroughly cleaned, disinfected, repaired, and bonded, before finally undergoing the final finish. See more Miracle Method case studies online, or call 888.902.0515 to speak to a Miracle Method franchisee near you. Squeegee down the walls, tub, and curtain (if possible) to prevent moisture from creating mold or mildew. 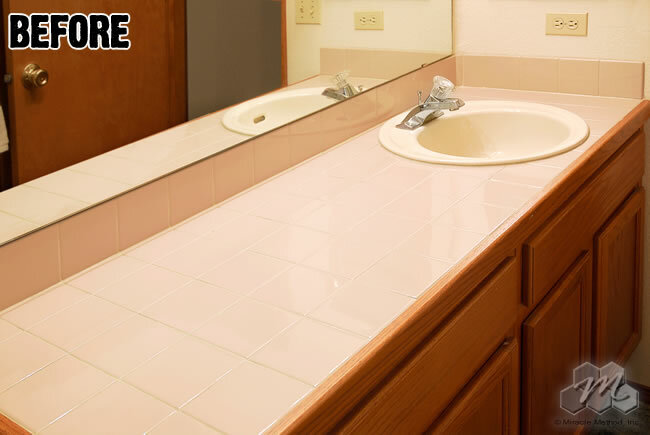 Here at Miracle Method, we firmly believe that surface refinishing is the best choice for bathtubs, ceramic tile, and kitchen countertops that need surface repair, making them look like new. That said, we also firmly believe in routine maintenance and care for bathtubs. Today, we’re going to be discussing preventing and removing mold and mildew. Mold and mildew go beyond simply making a room unattractive. It can disperse microscopic spores into the homes air. This is harmful to your health, and can cause anything from a mild allergic reaction to much more serious ailments. Mold and mildew grow wherever there are high amounts of moisture and humidity. For bathtubs, sinks, and kitchen countertops, one of the simplest preventative measures comes from using a squeegee to direct any remaining water or other liquids down the nearest drain. 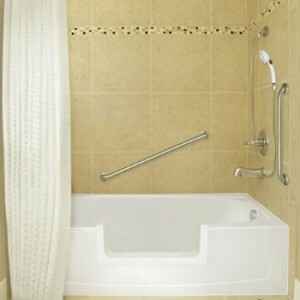 With showers and bathtubs, post usage, squeegee down the glass doors or curtains as best you can. All this help prevent the accumulation of moisture that can spawn mold or mildew. You can help prevent mold and mildew by using typical household cleaning supplies such as bleach, dish soap, detergent and hot water to scrub out the respective areas. For shower curtains (fabric or plastic), the simplest solution is putting them in a washing machine with hot water, heavy detergent, and a little color-safe bleach (3/4th of a cup). After it’s washed, hang it up and let it air dry in a dry area. For everything else, start with a couple spoonfuls of dish soap mixed with a bucket of hot water, and a non-scratch brush or scouring pad. We recommend scrubbing the problem areas, as well as the surrounding areas. Next, mix up about 3 cups of warm water with a quarter cup of bleach, and then put it into a spray bottle. Use this to cover the whole area, wait about 10 minutes, and then rinse everything off with water and squeegee the bleach/water down the drain.